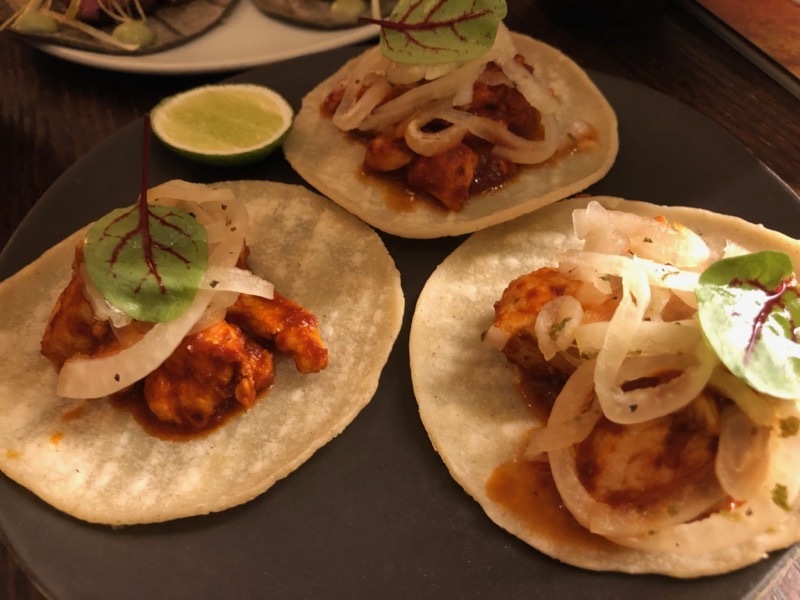 We had eaten some truly incredible Mexican food while in Bali at Taco Beach Grill. So, it really had a high bar to match. We booked our table for around 5.30 as we assumed that with so many theatres nearby we didn’t want to be left high and dry panicking. Oh, how silly I felt walking in to an empty restaurant saying we had booked a table to 2. Alas, had we not it would have been sods las that the restaurant would have been filled up. We both went for the lunch and pre-lunch menu. 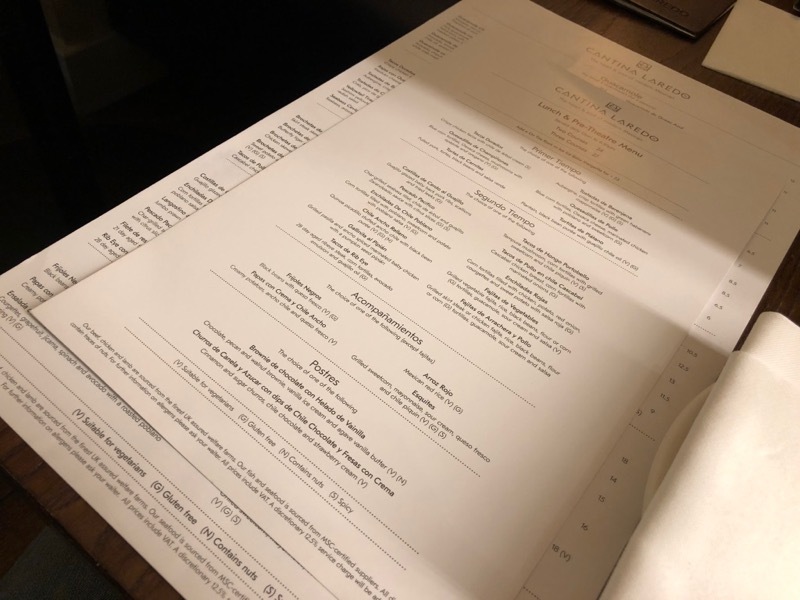 With two courses costing £24, and three courses £27, it made sense if room allowed to go for all three. As we like to sample as much as the menu as we can, we ordered different dishes each and sampled a bit of everything. Tacos de Rib Eye, and Tacos de Pollo ex Chile Cascabel. Accompanied with a serving of frijoles negros (black beans) and esquites (grilled sweetcorn). When the food arrived you could tell that the food was going to be massively different to that we ate in Bali, Indonesia. Firstly, the portion size was much smaller, very much in keeping with the style you get here in central London. Right. Enough. Lets get eating! 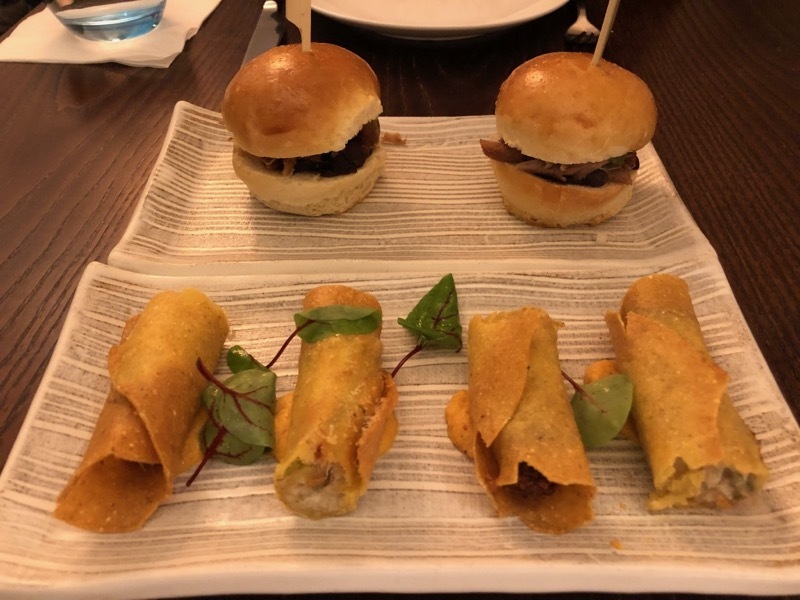 I’m not going to lie, the starters went in a total of 6 bites each. I get that they are starters and set the meal up, and there we quite nice. The filling on the tacos dorados were beautiful. Lovely and light, almost mousse like. Perfectly setting us up for our mains. Out popped 4 plates of truly exquisite food! 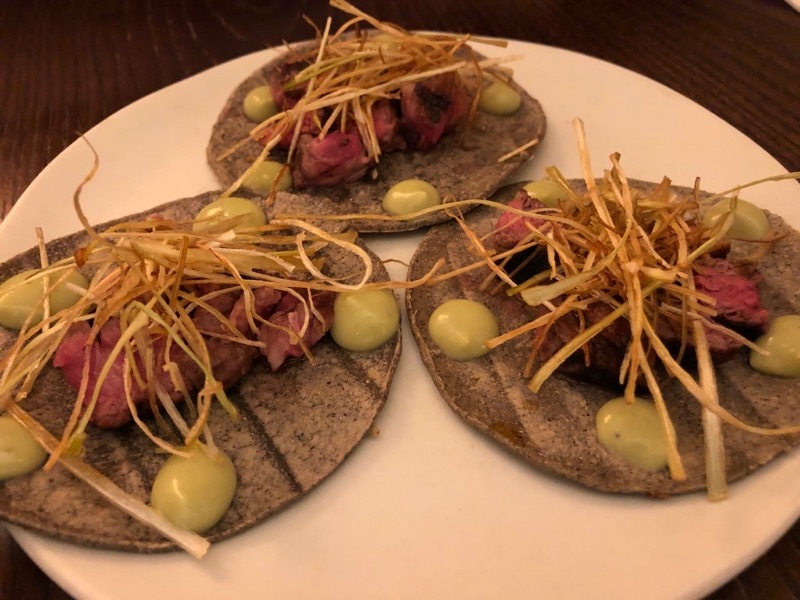 I mean, have a look at the rib-eye tacos below! How could you even eat that work of art. The perfectly cooked rare steak with what looked like crispy spring onions, and the guacamole emulsion. There isn’t an elegant way to eat tacos at the best of time, so we just tucked in. Who was going to have the odd taco of each? Turned out, this was easy. I preferred the rib-eye steak and Tina preferred the chicken ones. 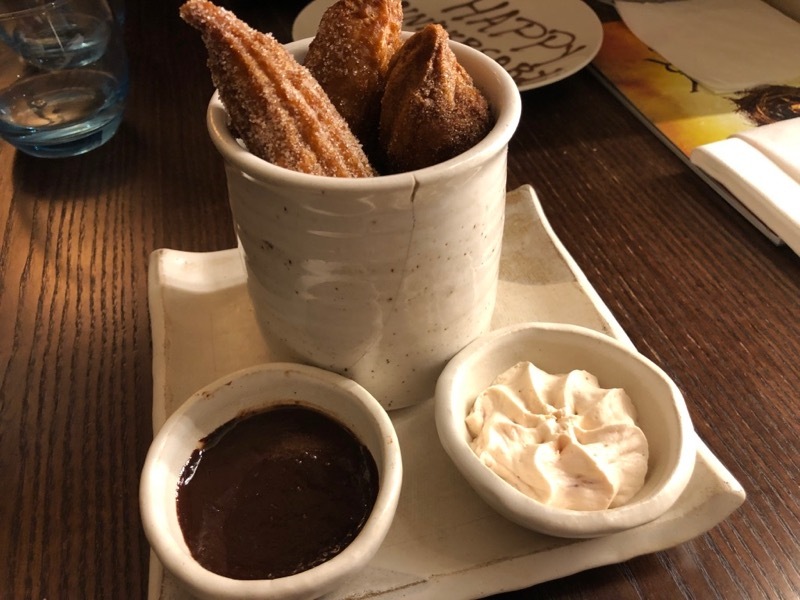 Feeling a tad full at this point, there was never chance of us not eating the churros on the menu. Slightly intrigued with the strawberries with cream. Oh. My. God! The best course was very much left to last. 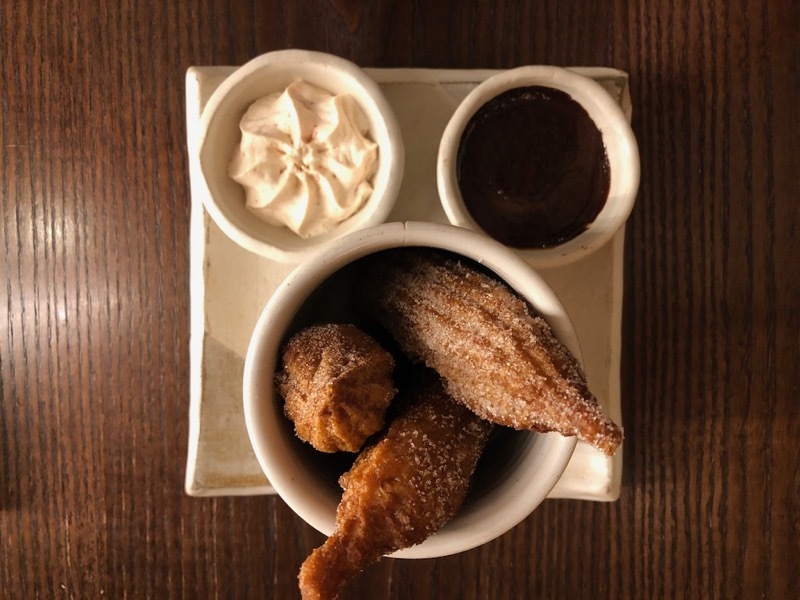 You had 3 churros with a chocolate and starwberries with cream. Now, it was obvious that the strawberries with cream was just a cream with chopped strawberries whisked within. Holy sweet moly. 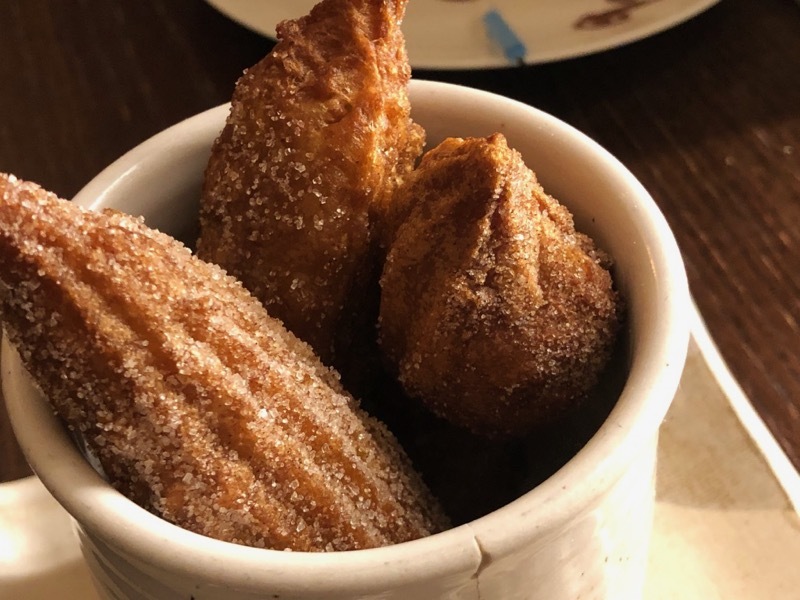 The churros was like a sweet cloud, so soft and with some of the chocolate and strawberry cream was a delight. The table next to us looked in awe and had to order some on the back of us eating them. As a quick pit stop between shows this place fits the bill with their pre-theatre menu. However, as an evening meal place, I would find this place fall well outside our price range. As you would be looking at well over £100 for a couple dining with ease. 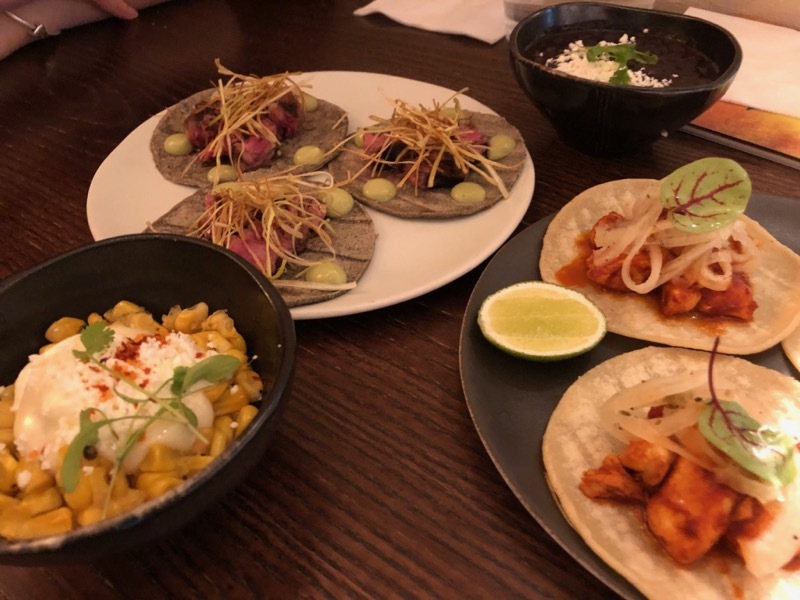 If you like was you see and want to stuff your face full of that fresa con crema head over to the guys at Cantina Laredo in central London. You can find them at 10 Upper Saint Martin’s Lane, London, WC2H 9FB.